Friends of Herrontown Woods (FOHW) held a picnic last month with games, food, and presentations to celebrate Oswald Veblen’s 138th birthday. There’s a lot to celebrate, with Princeton Council agreeing last week to accept the property from Mercer County and the FOHW stepping up work on various environmental projects and looking to renovate the Veblen House and Cottage. The Council is currently working on an agreement with FOHW to specify responsibility for stabilizing and maintaining the aging structures that used to be the Veblen homestead. In the meantime the all-volunteer FOHW have “dramatically transformed the Veblen House grounds,” according to FOHW President Steve Hiltner, by planting a Phoenix Garden with 200 native plants representing 85 species, and beginning to create an edible forest and rain garden to demonstrate the use of runoff in the landscape. A year ago, Mercer County agreed to transfer ownership of the property to the town of Princeton, resolving years of discussion about the fate of the park, which includes a house and cottage formerly owned by the renowned mathematician and his wife Elizabeth, who gave the property to the county in 1957 and 1974. In addition to his own work in mathematics, Veblen has been acclaimed for saving lives and careers in bringing the Institute for Advanced Study to Princeton, helping to make the U.S. ascendent in the world of mathematics, and initiating the open space movement in Princeton. The FOHW have returned the ground around the house to the original grade and discovered in the process long-buried stone walls and parts of an elaborate drainage system. 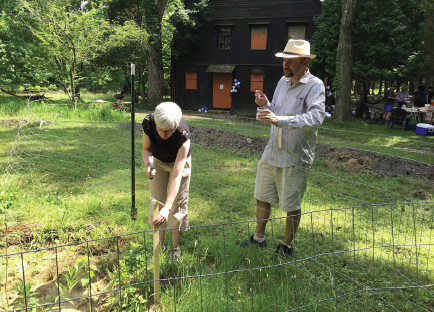 They have also cleared away a sea of invasive plants in order to plant the native Phoenix Garden, looking to now add labels and pathways to provide a place where visitors can learn more about native plants of Princeton. Restoring vistas by removing brush, FOHW volunteers weeded out invasive species and planted hazelnut, pawpaw, and the rarely seen butternut tree to establish the beginnings of an edible forest. FOHW also takes care of a replanted detention basin that catches runoff from the Smoyer Park parking lot, helping the town and Partners for Fish and Wildlife (a federal agency) transform it from turf grass into a native wet meadow. Girl Scout Cadette Troop 72905 from Princeton recently helped plant seeds of additional native wildflowers, and there is a project in the works to create podcasts so that visitors can learn more about Herrontown Woods’ cultural and natural features, including the magnetic rocks found there. Hiltner, who is a botanist and naturalist, is looking forward to focusing the FOHW’s energies on renovating and repurposing the buildings. “We feel this project is transformative for Princeton,” he said. It includes history, ecology, and sustainability.” He is hopeful that they can soon get insurance so that volunteers and professionals can make preliminary repairs on the buildings to head off further deterioration in the property that has been vacant for about 20 years.